Autumn and Winter overlooking the Taughannock Falls near Ithaca, New York. According to the calender, we are about a month before the Spring Equinox and the celestrial end to winter. That may or may not be true where you live. This is a good time to remind those who wish to take part in the Four Seasons 2011 Assignment to get out there and photograph your Winter shot. Spring will be here before you know it! Anytime you need to review the assignment, I added a link under Assignments in the right sidebar. This entry was posted in Assignments, Nature and tagged autumn, equinox, fall, new york, seasons, spring, state park, taughannock falls, waterfall, winter. Bookmark the permalink. Thanks, Terry! I could not get down to the same shooting location for the winter photo as the park had the stairs closed. Though it looks like some people climbed the fence and risked it. Not sure I would. That’s a 200 foot drop at the bottom of those stairs!!! *sigh* That’s one challenge I won’t be participating in… just couldn’t find the right subject. As you well know, Robin! But seeing it this way in big jumps of time the contrast really is startling. I found a scene of a house that I like and took a winter picture of it, but not sure if I’ll be brave enough to go back and take the Spring, Summer and Fall shots. The house sits on a busy road and I have to stand in front and near the road to get a good shot. 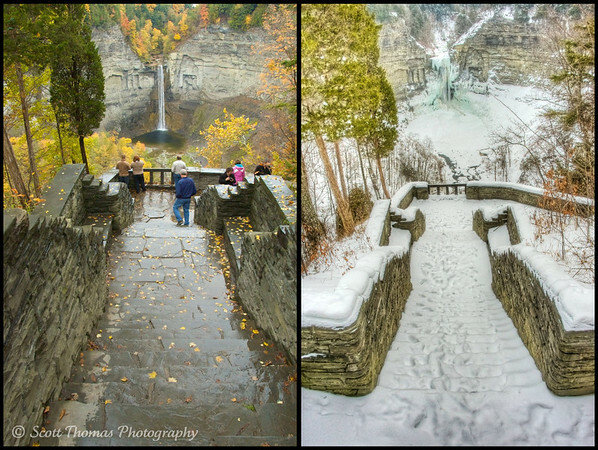 Love your two images, the season makes a dramatic change in the same location. I hope you can, Nye, but do be careful. What? You already have Spring? Thanks for stopping by my blog, I’ve really been out of the loop lately. Love the perspective on these shots. Not sure if I’ll get a good winter shot, maybe I’ll luck out with some early snow next year. We had our first snowfall in town this week and it didn’t even last for one day.